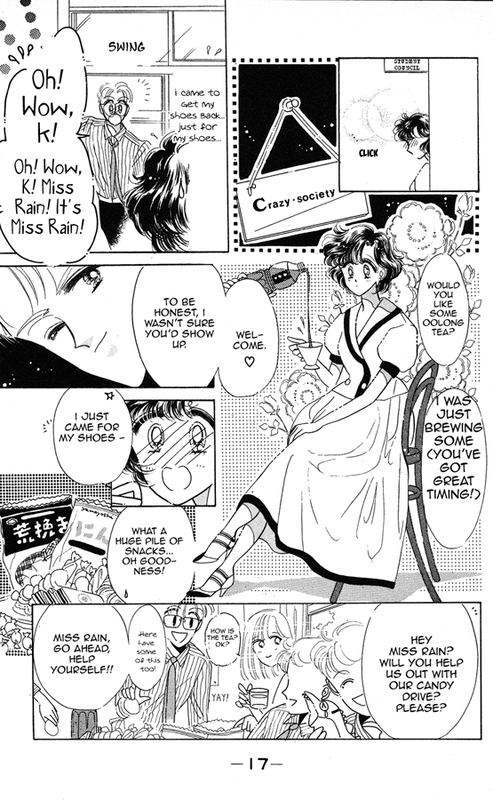 The short story “Miss Rain” was originally published in Amie Magazine as a one-shot series, but later was published as a tankoubon in a compilation of five short stories by Naoko Takeuchi, all themed around rain. 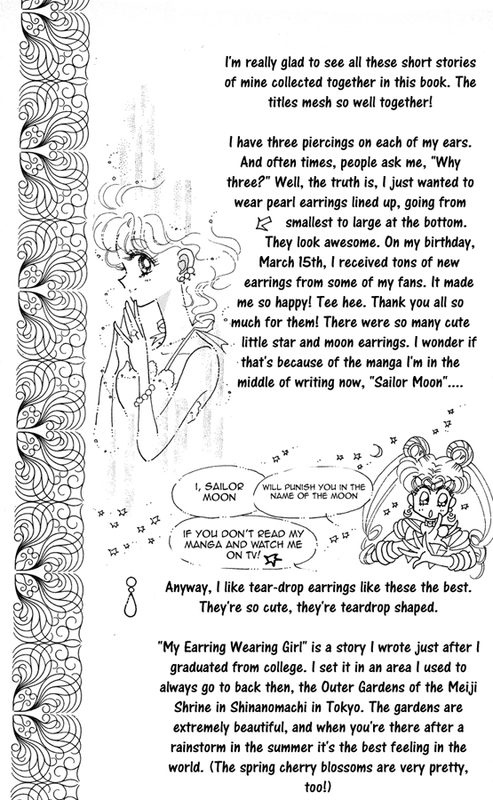 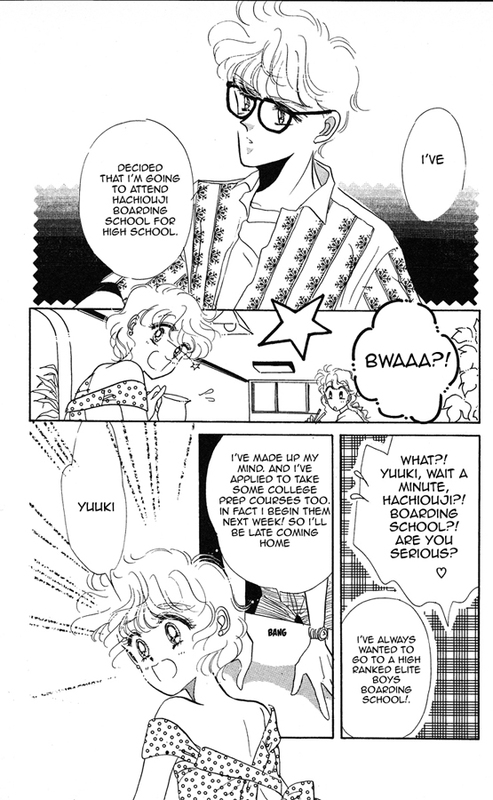 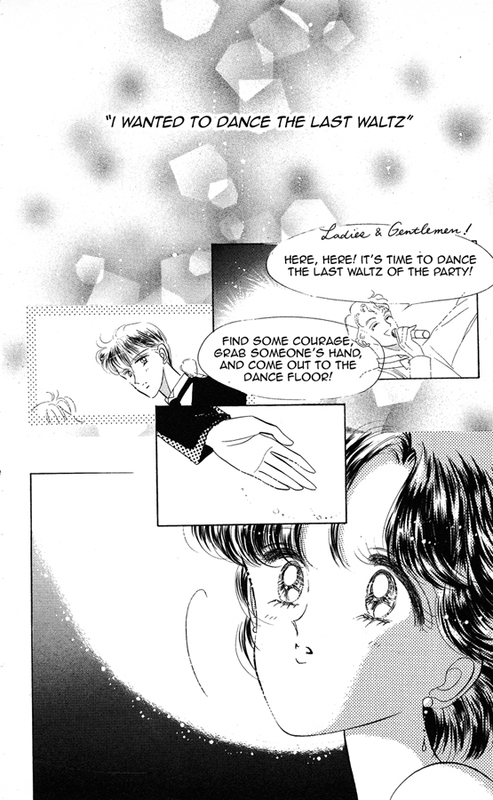 The later four short stories were originally published in Nakayoshi Deluxe magazine in the late 1980s – early 1990s. 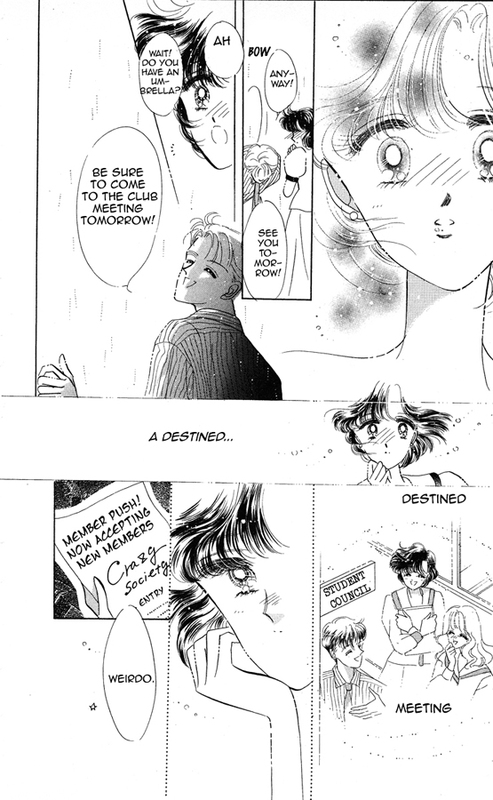 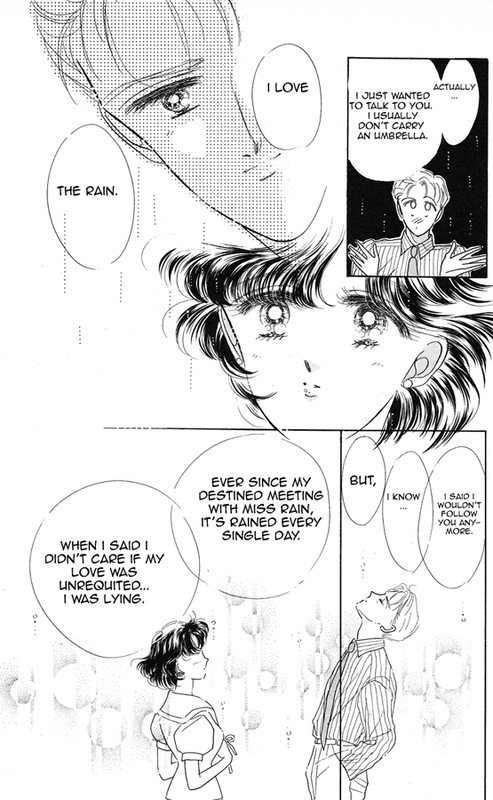 The short story Miss Rain by Naoko Takeuchi is the story of a girl named Kuramitsu Rena, nicknamed “Miss Rain”, because whenever she goes somewhere it begins to rain. 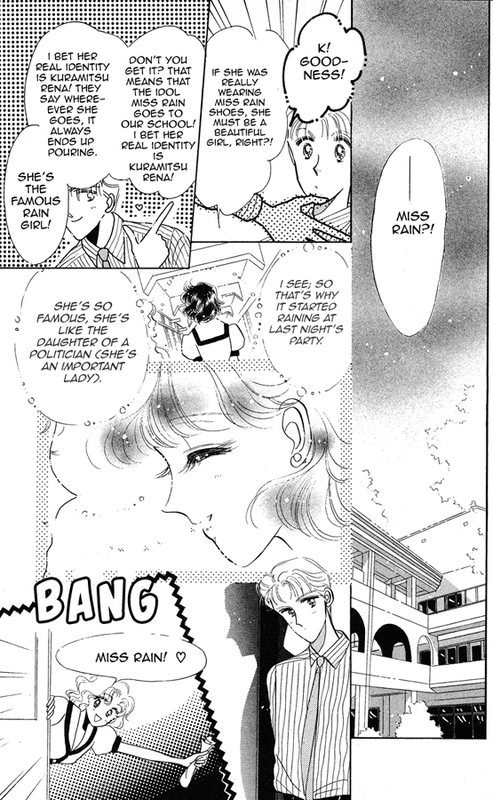 She has a crush on Furukawa Kei, the President of the Crazy Society club. 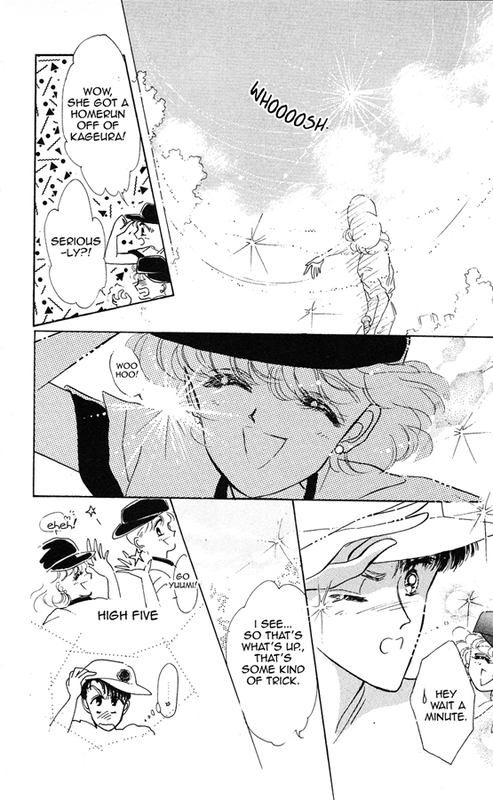 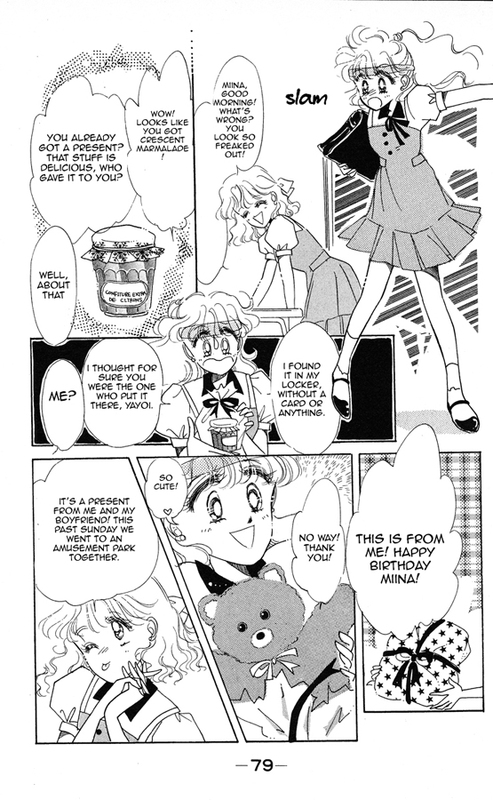 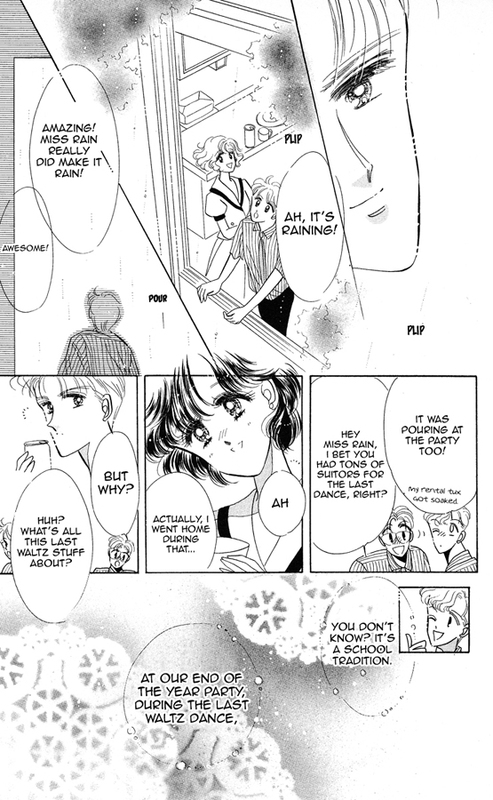 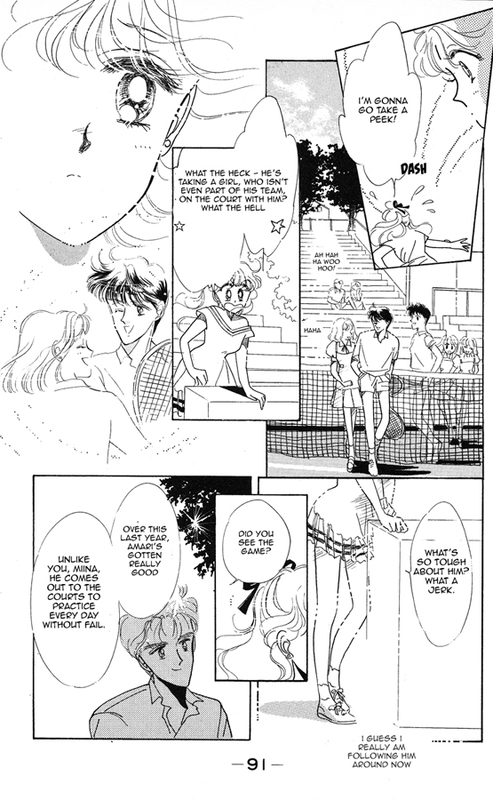 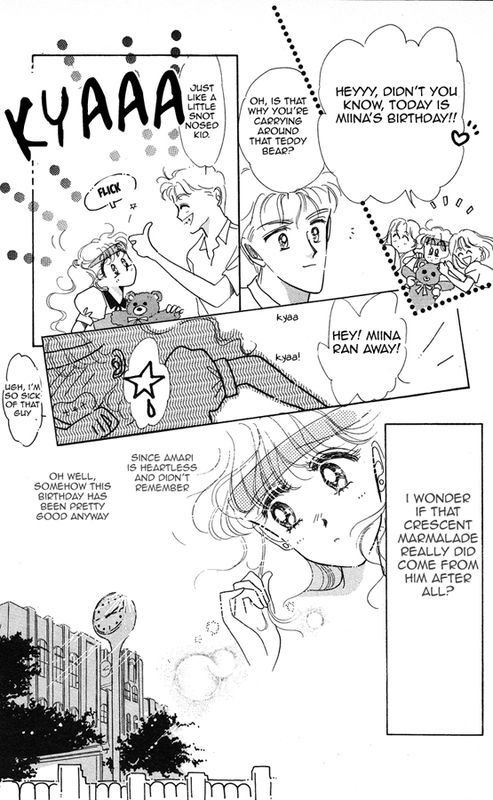 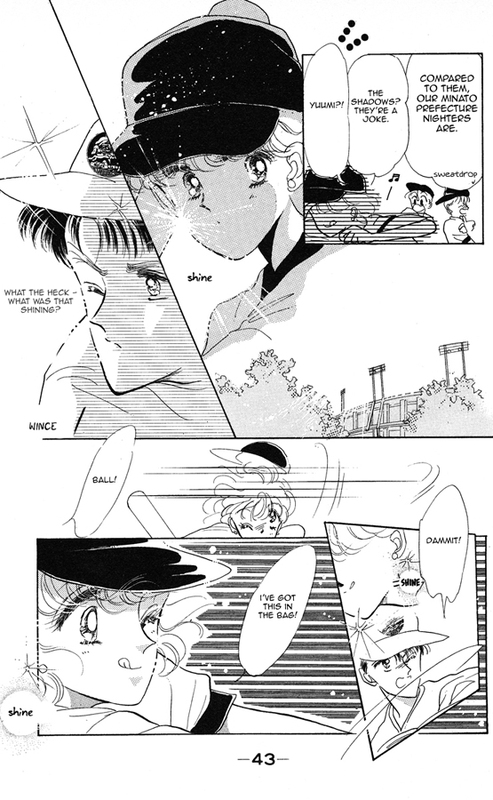 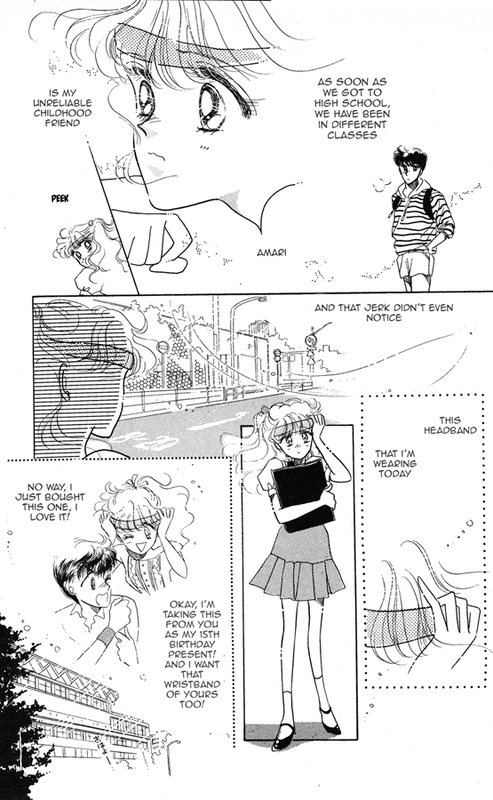 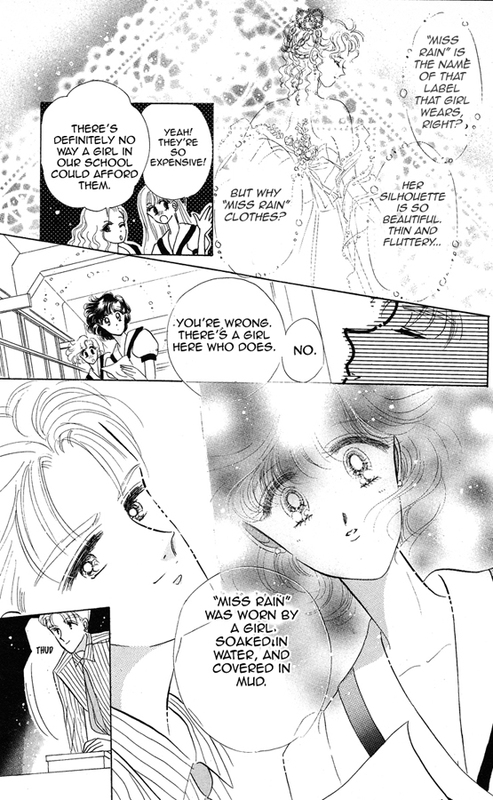 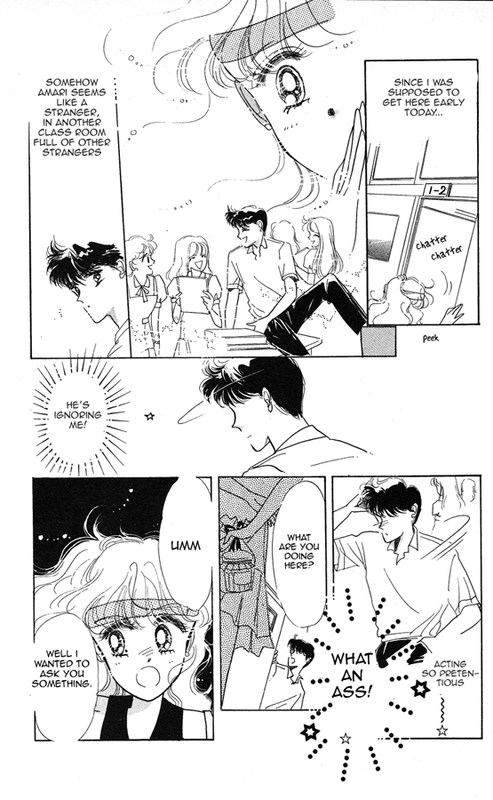 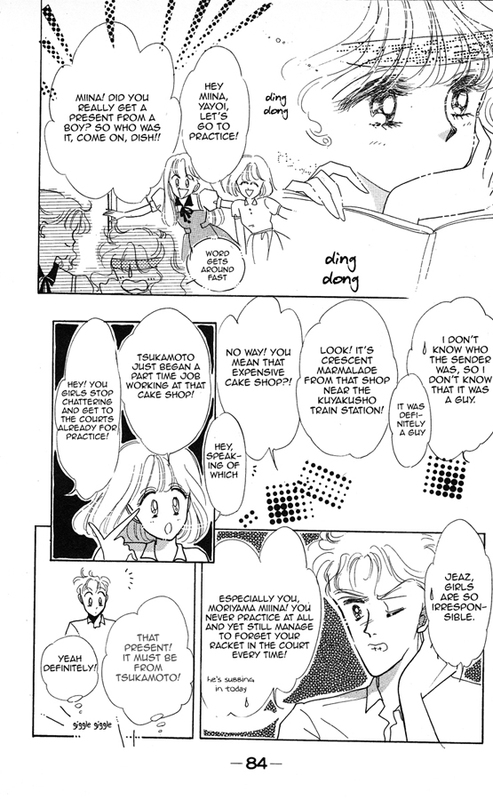 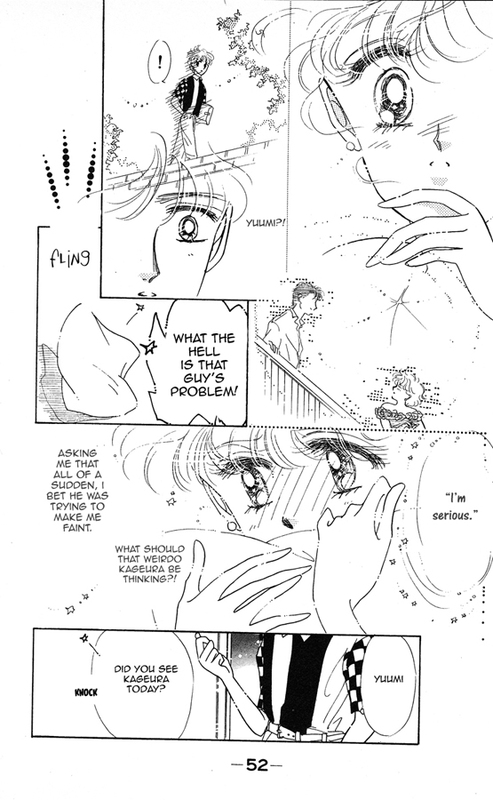 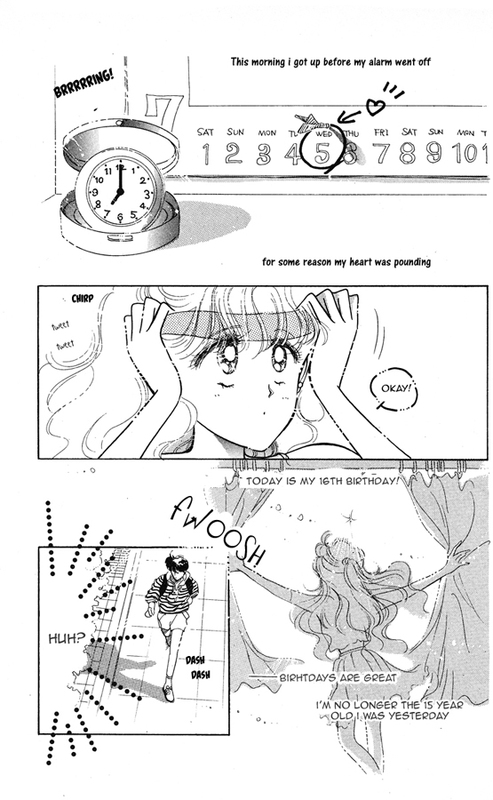 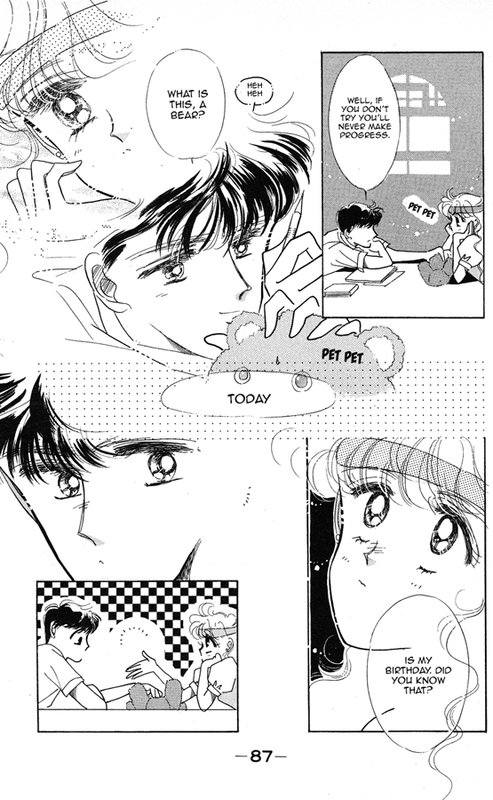 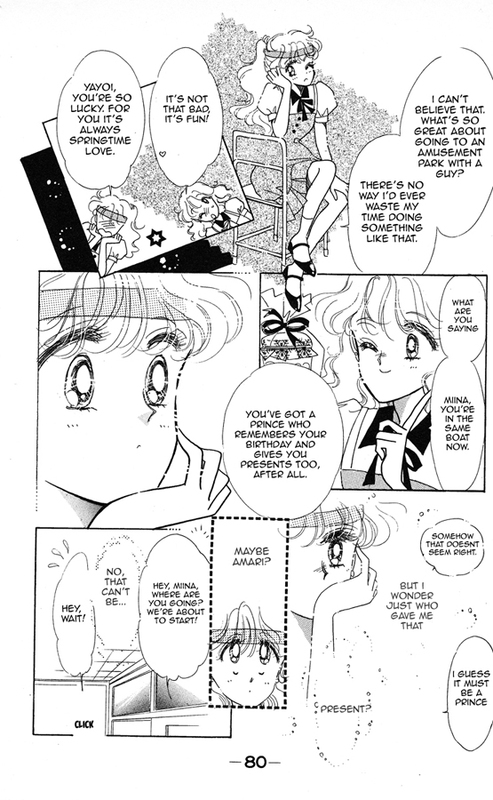 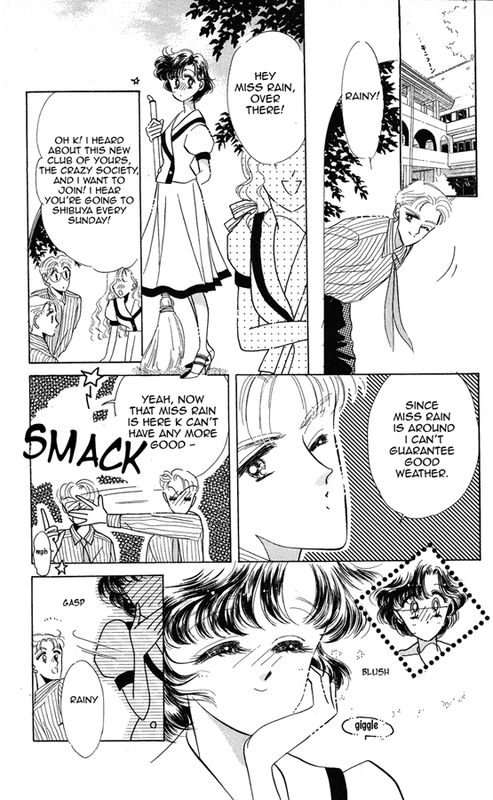 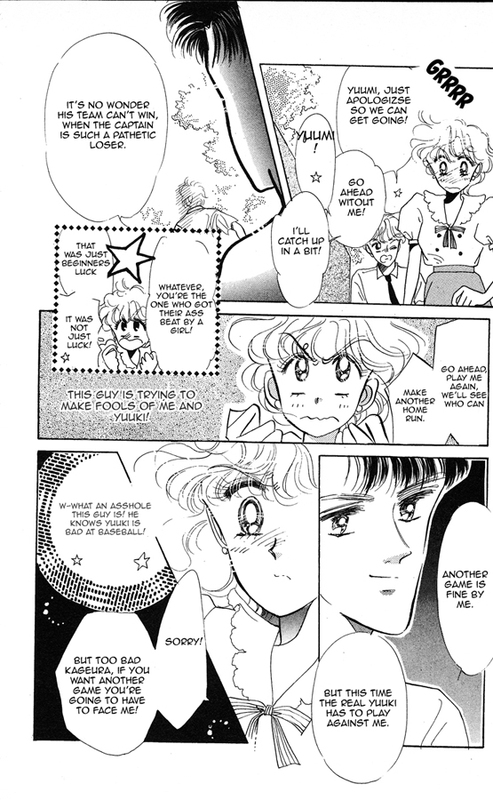 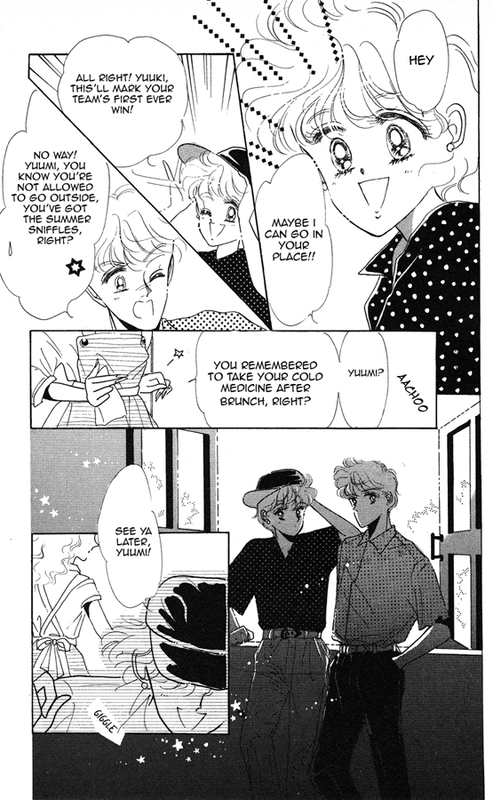 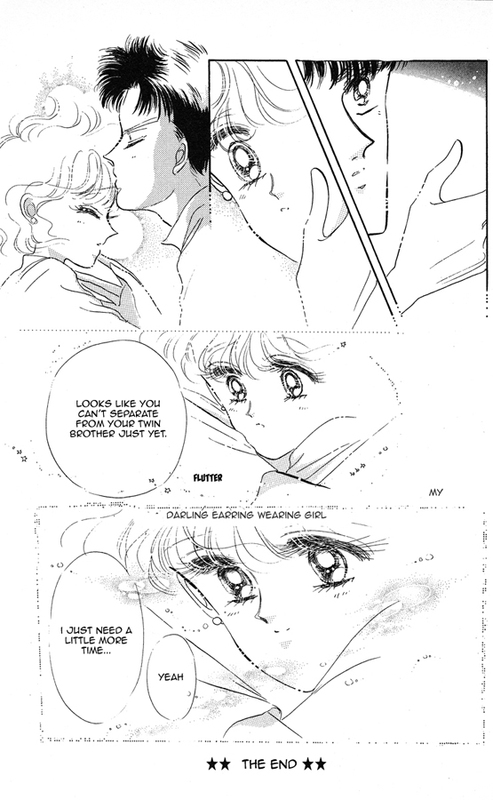 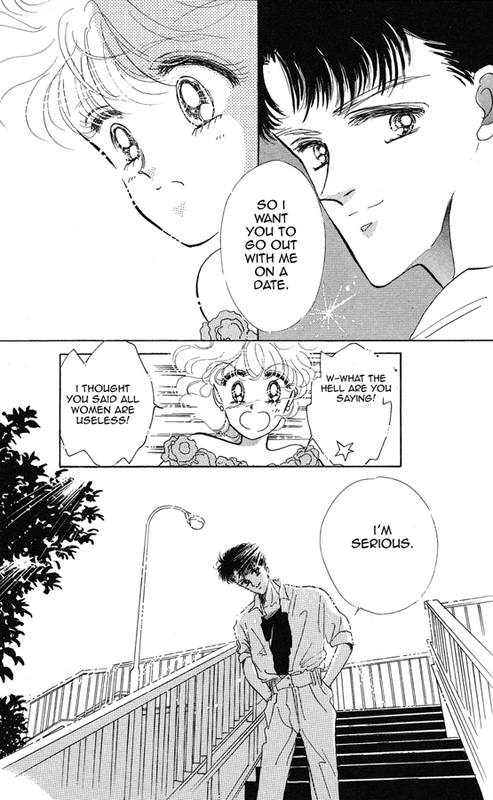 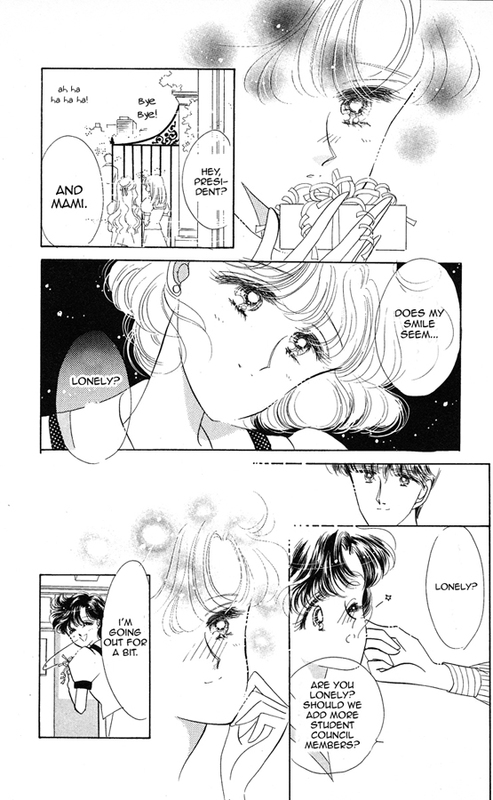 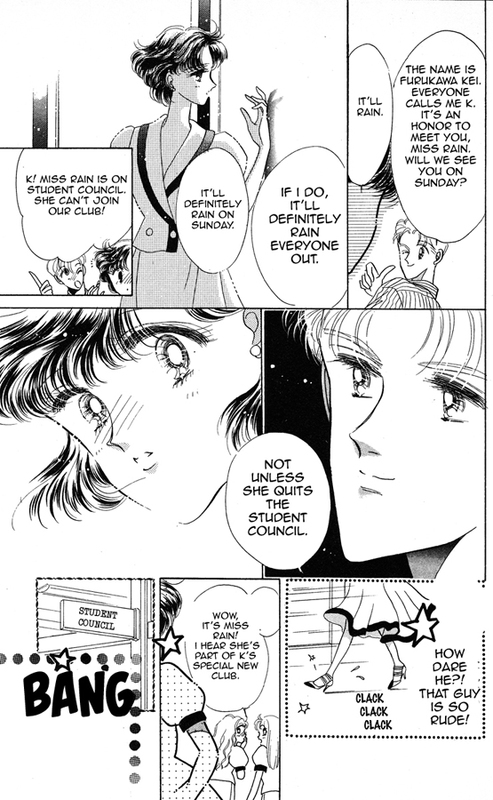 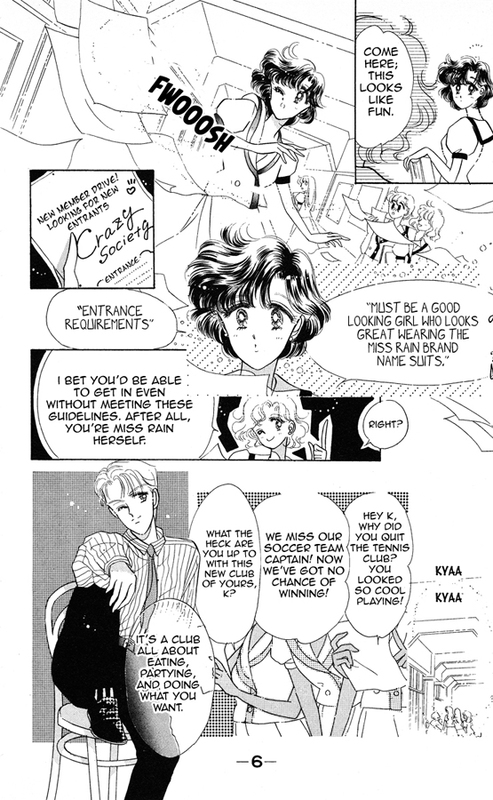 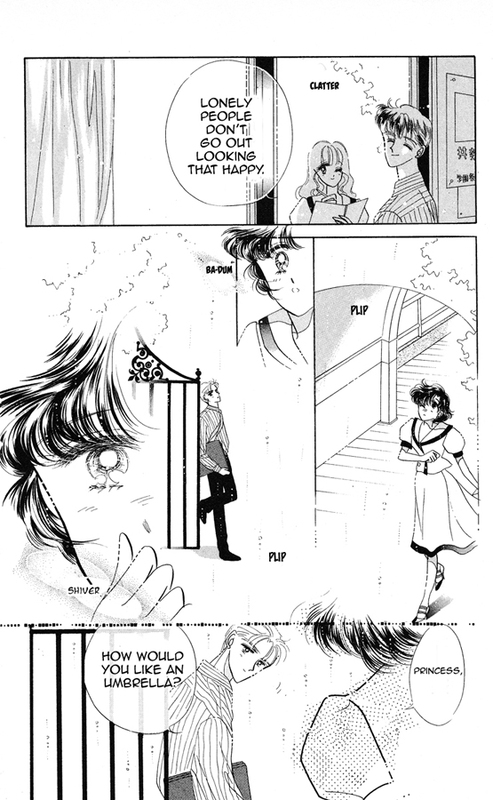 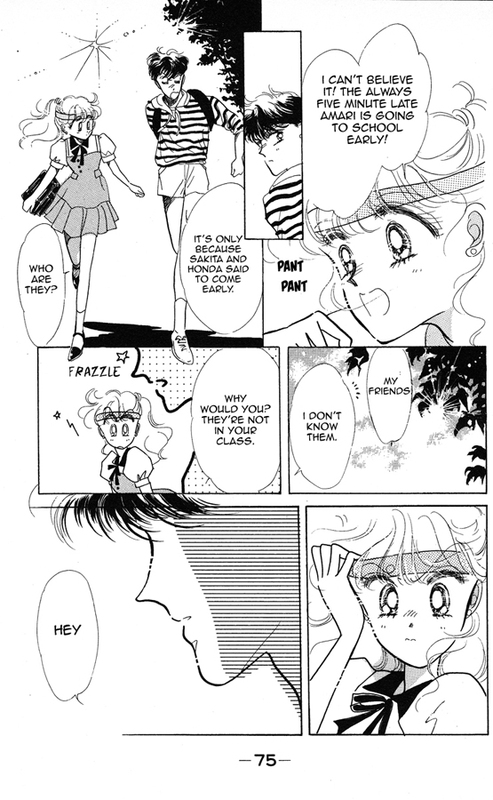 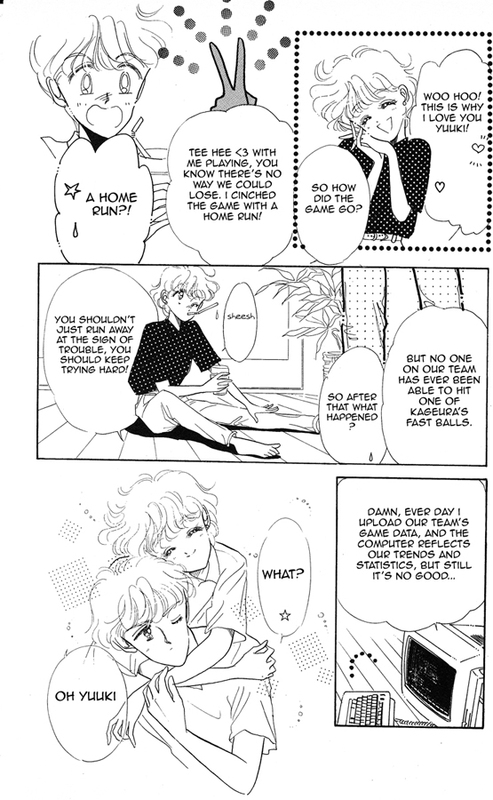 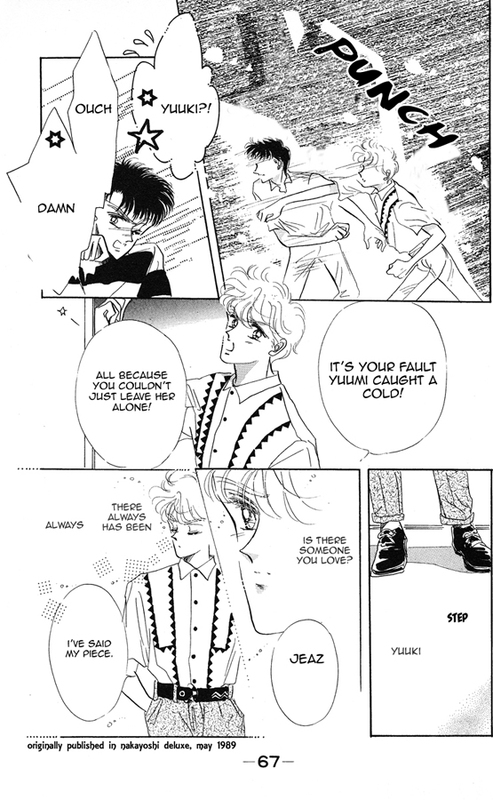 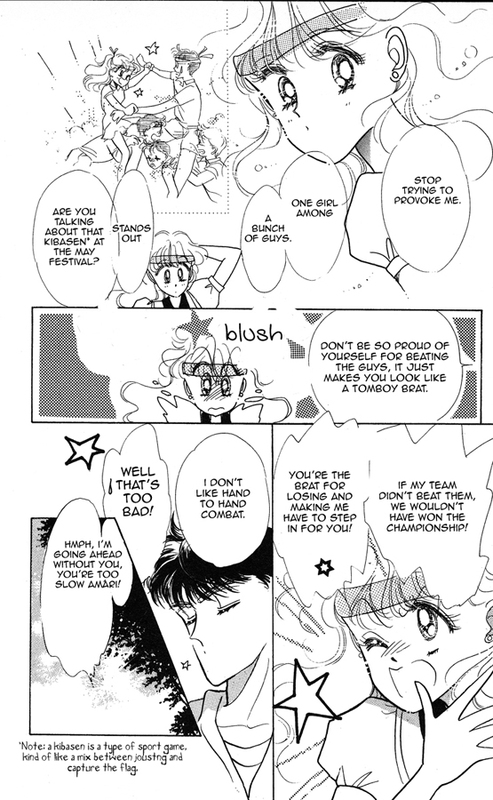 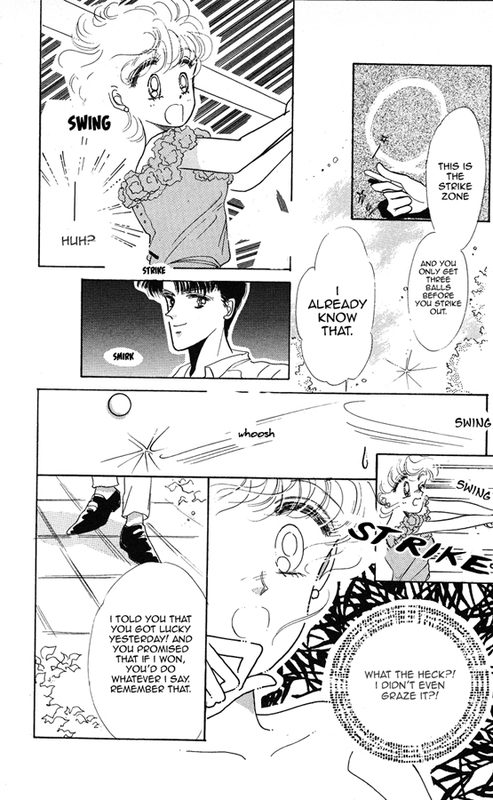 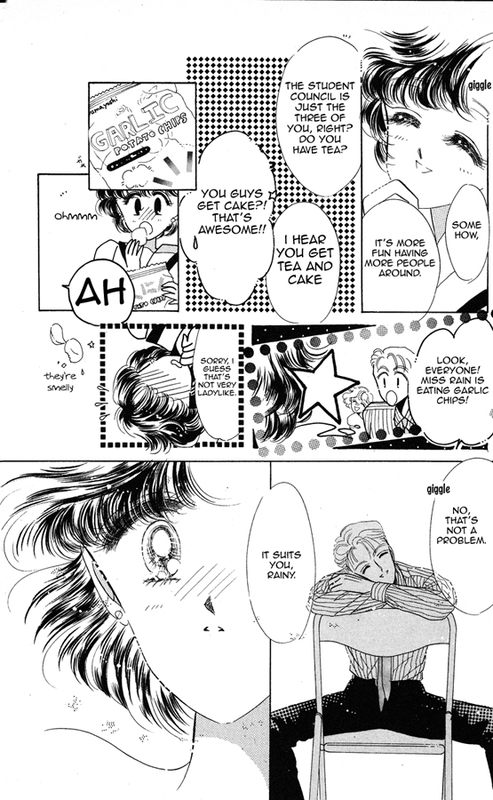 Miss Rain by Naoko Takeuchi focuses on the love triangle between Rena, Kei, and their friend Mami. 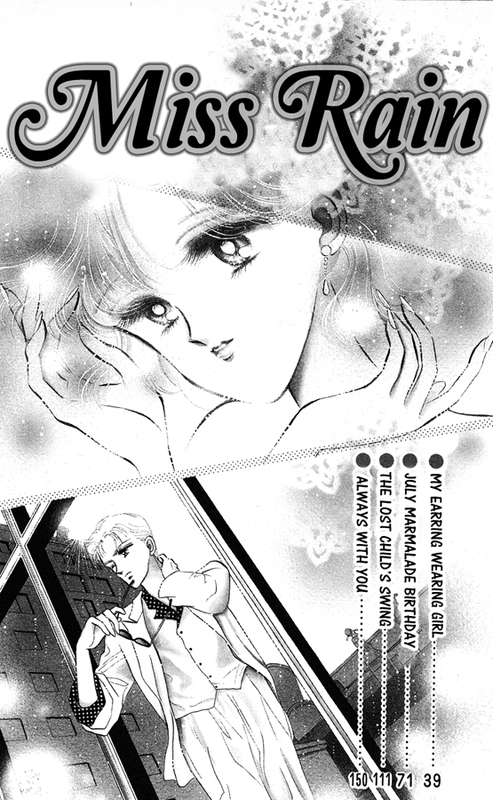 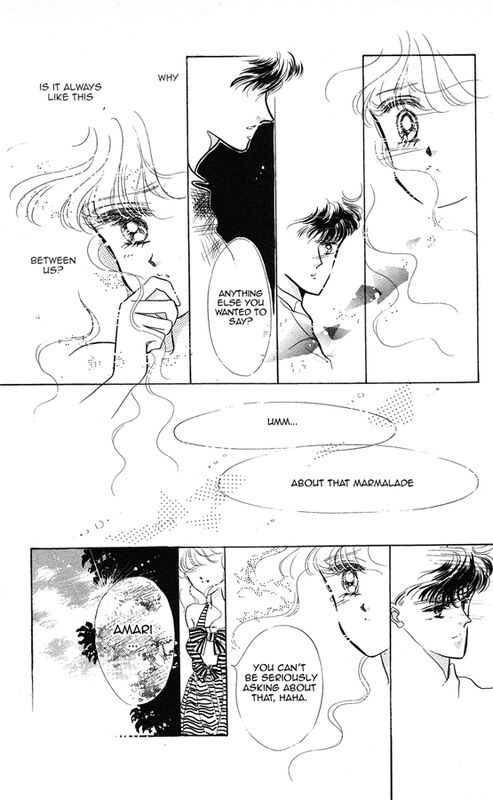 The story is super romantic and the art work is soft and flowery – a shining example of Naoko’s flowing, light style. 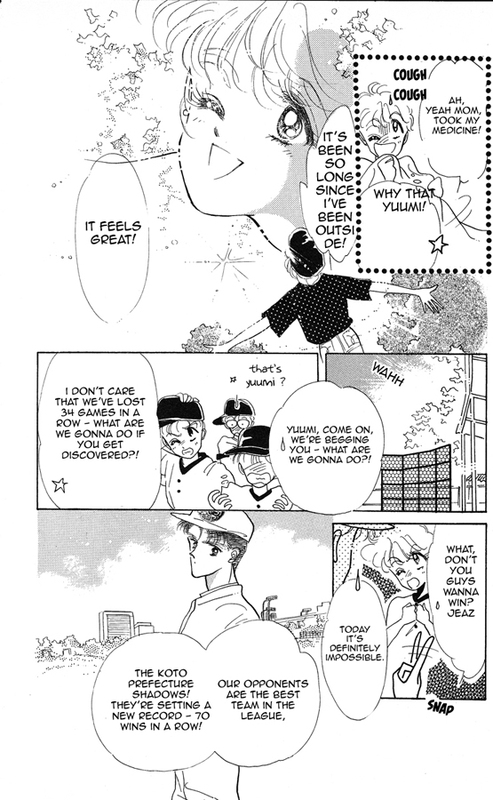 Boku no Pierce Girl is the story of a twin brother and sister, both of whom are baseball players. 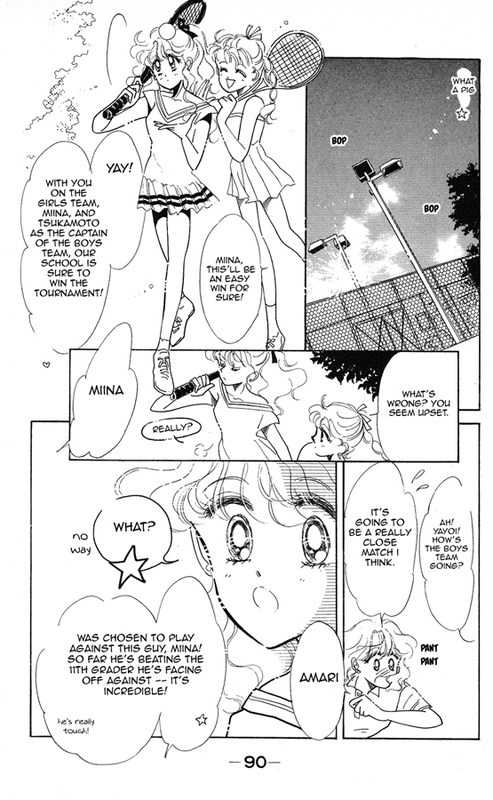 One day Yuumi, the female twin, takes her brother’s place in a baseball game, and is spotted by Kageura – a player for the challenging team. 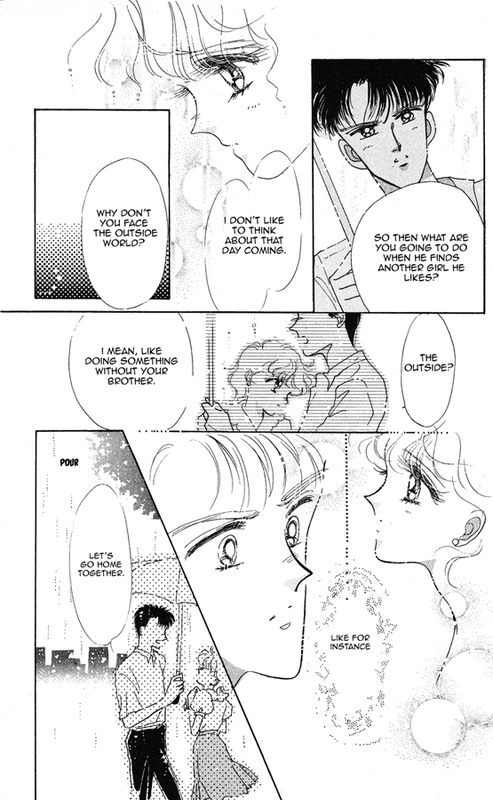 He notices her glimmering earring in the sunlight during the game and realizes that she isn’t her brother. 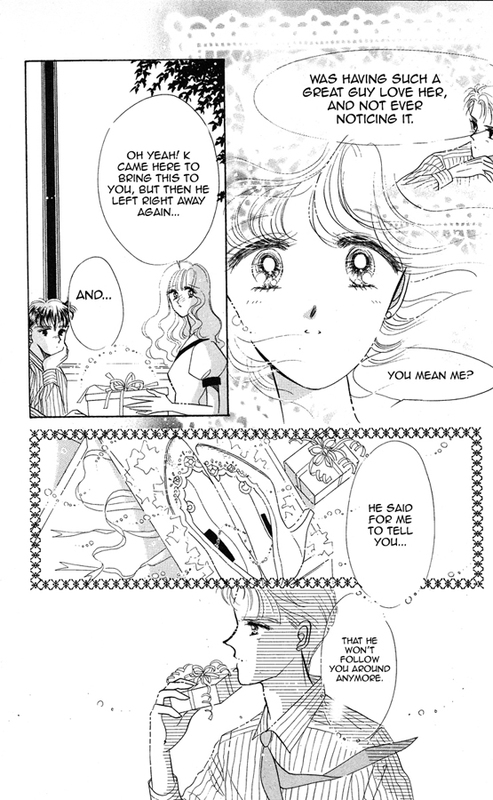 Kageura attempts to pursue Yuumi, much to Yuumi and her brother Yuuki’s dismay. 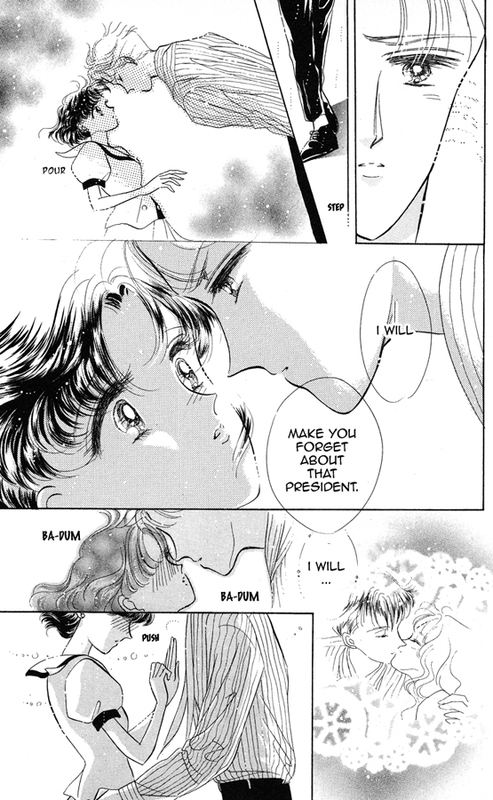 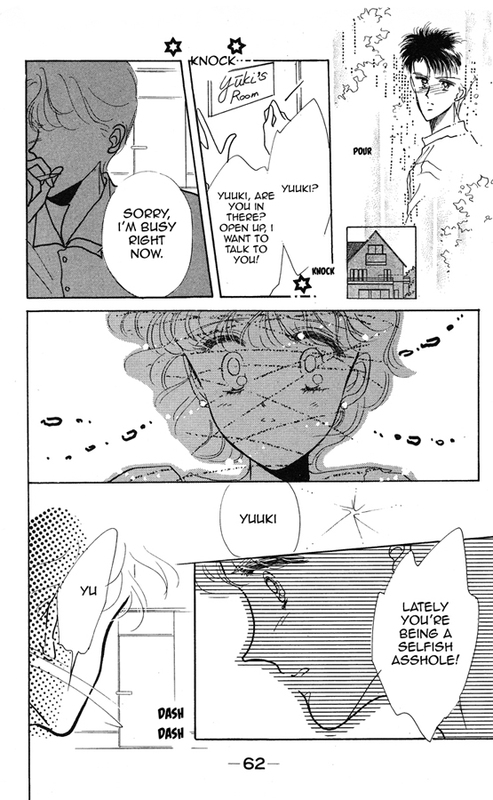 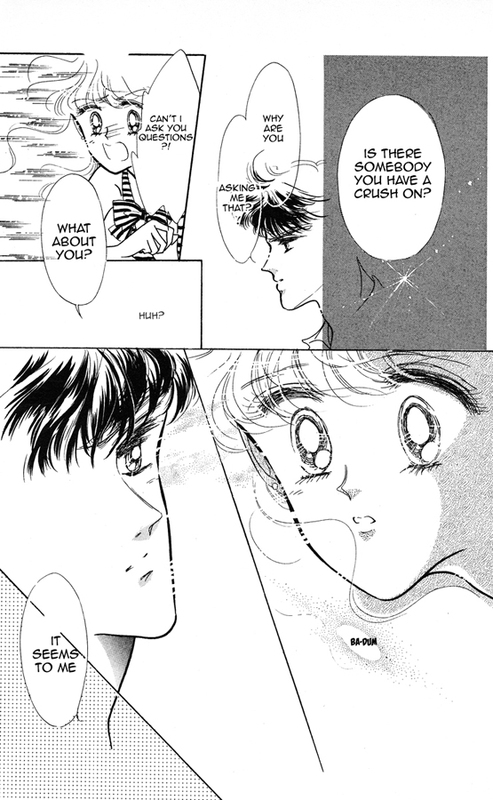 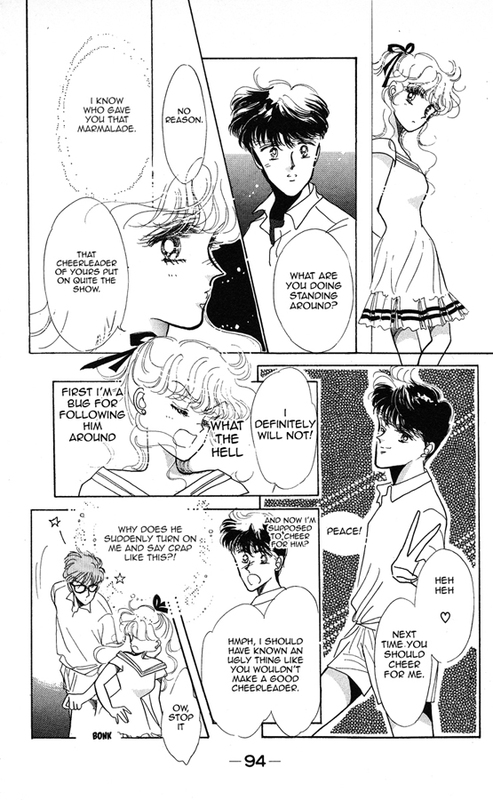 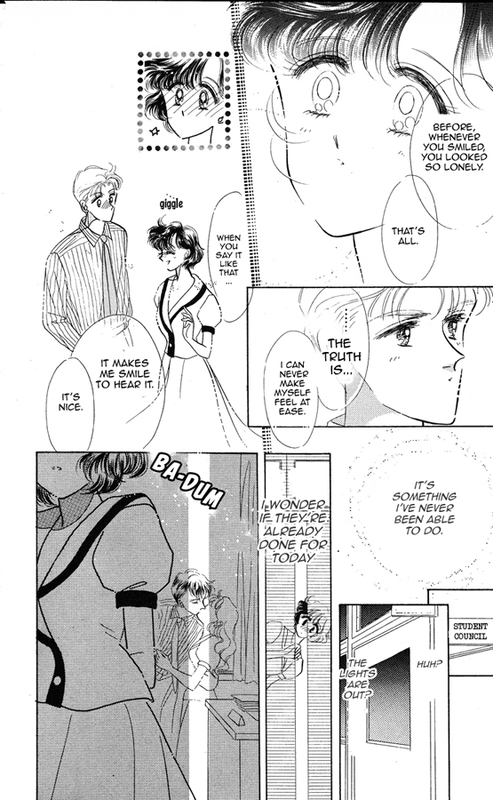 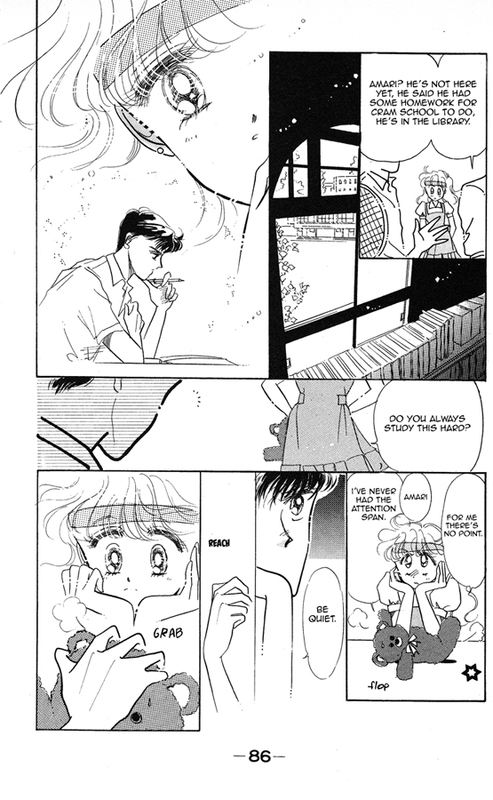 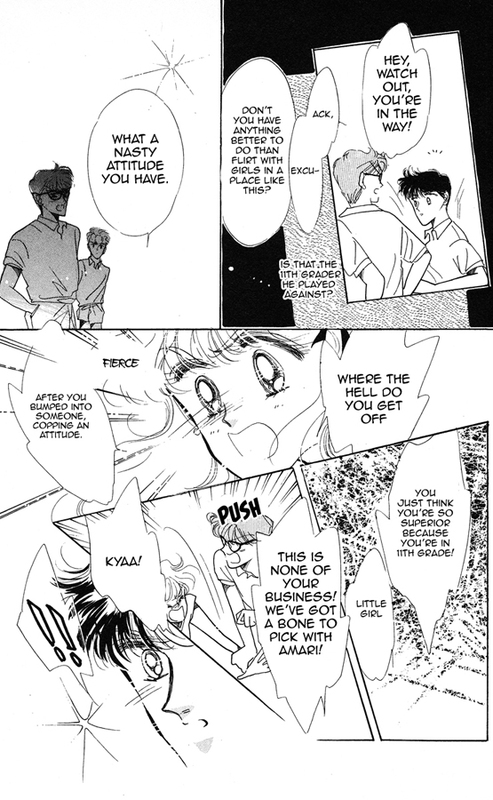 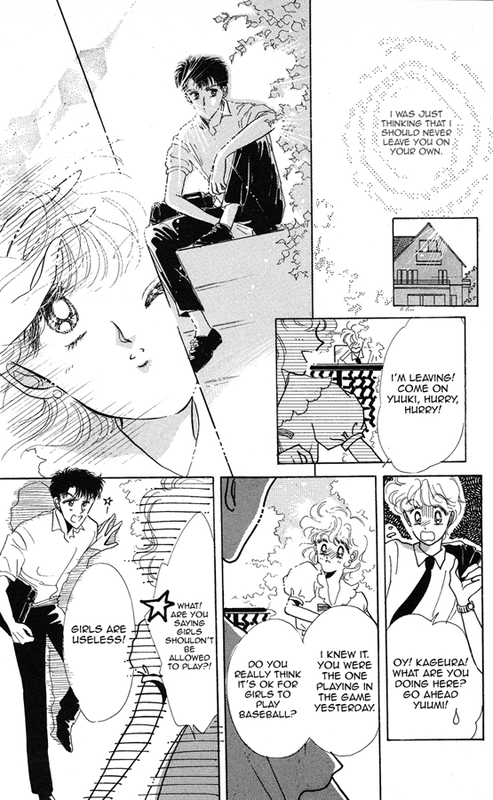 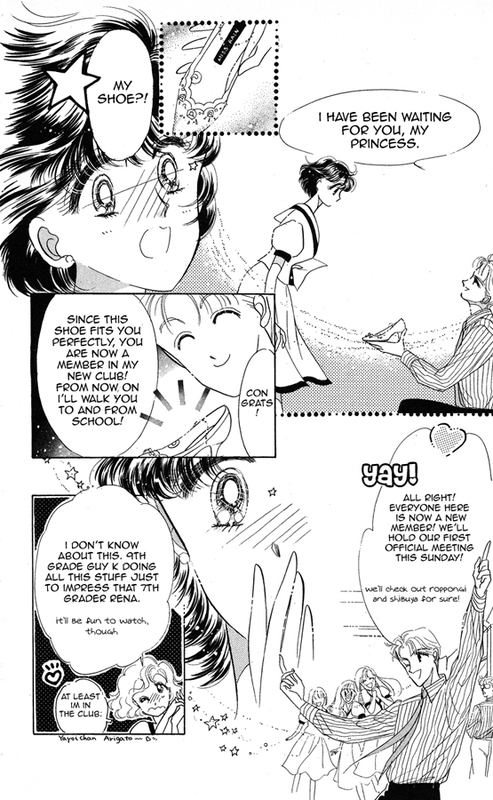 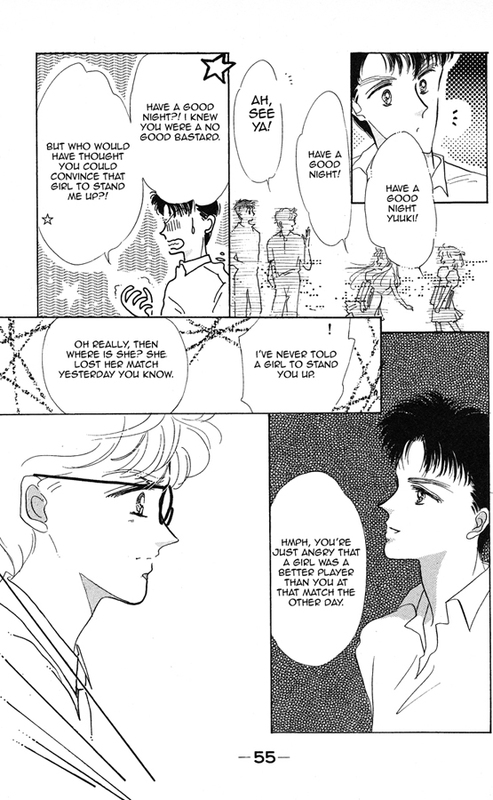 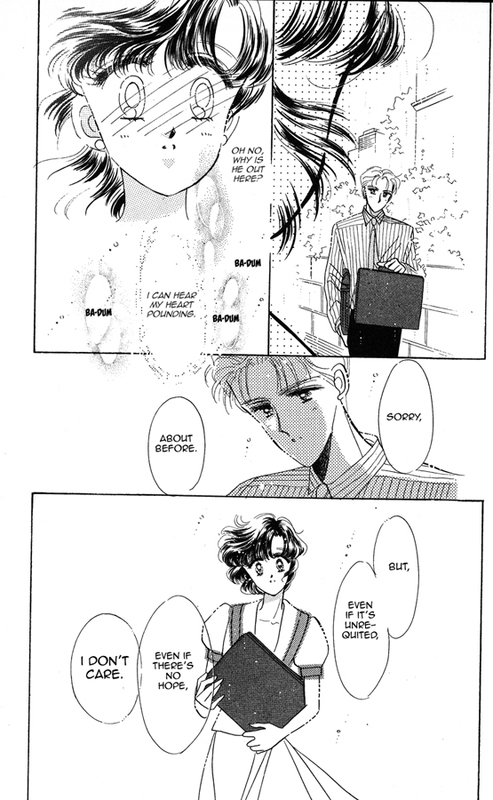 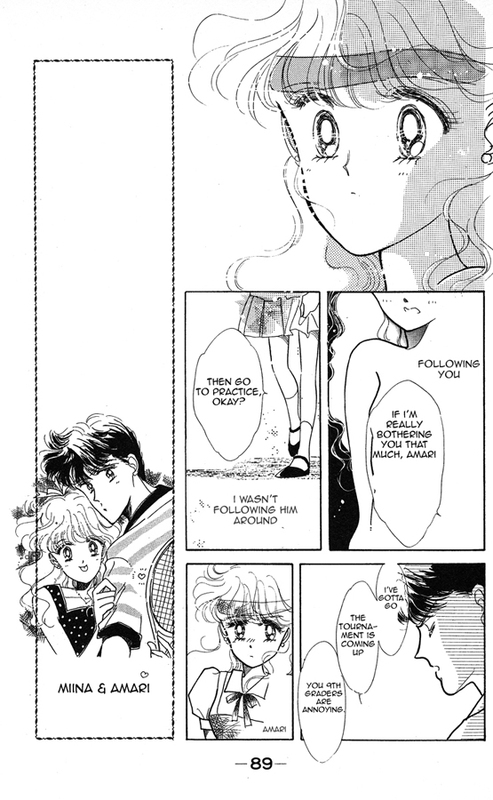 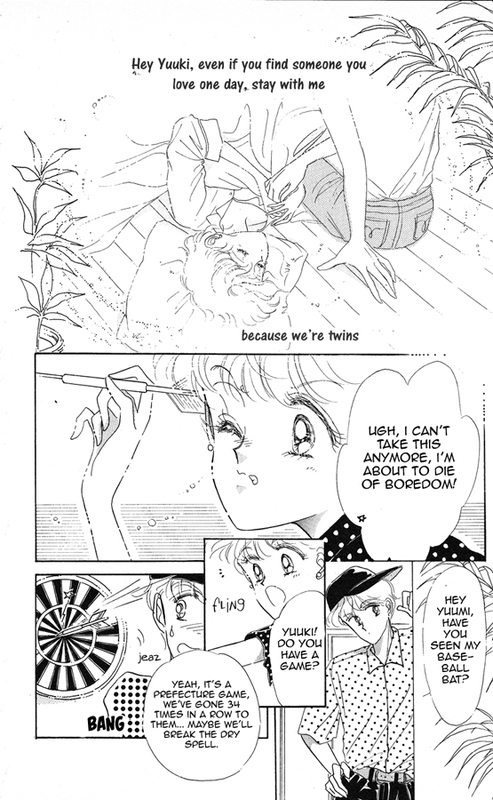 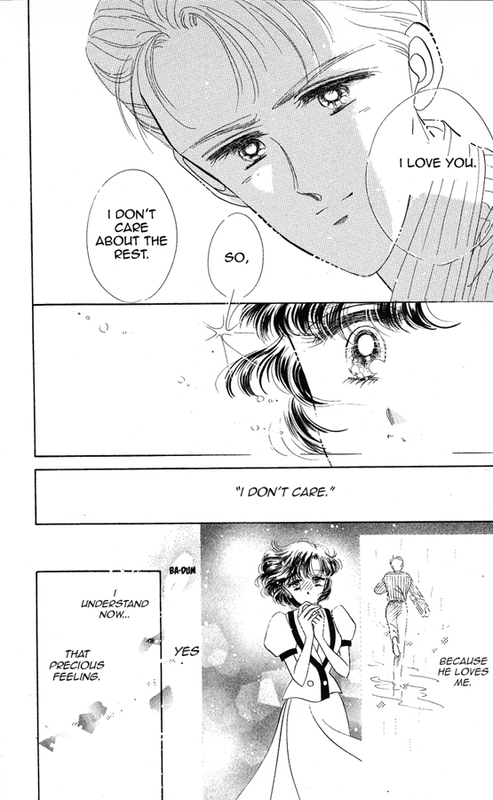 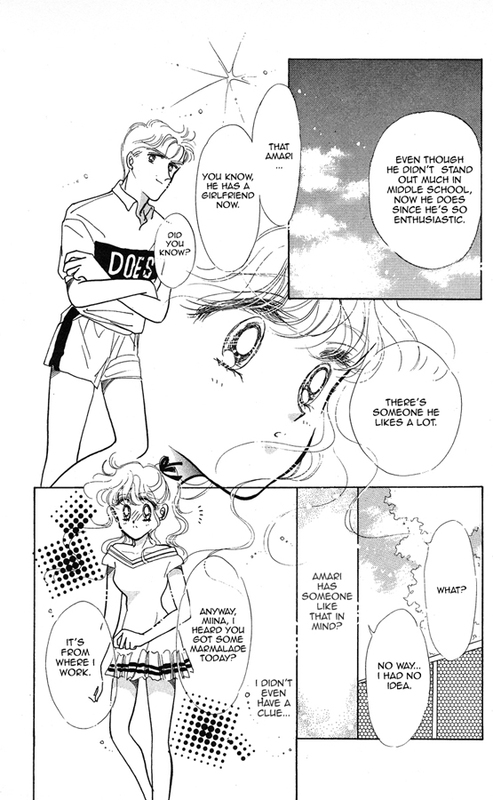 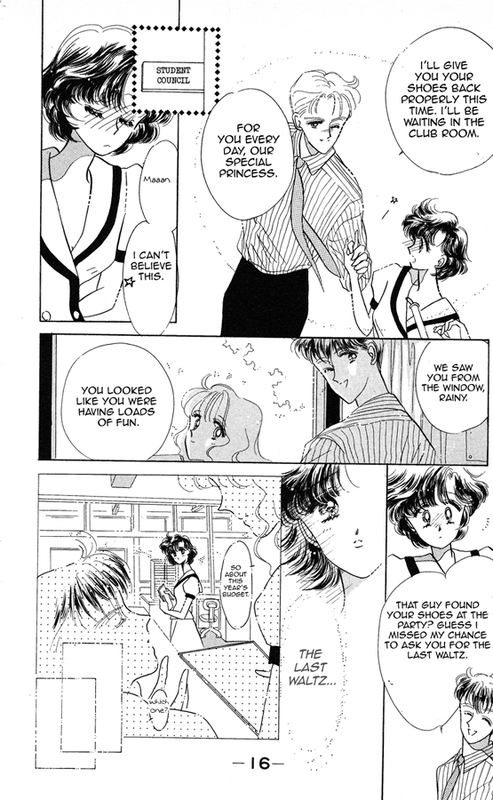 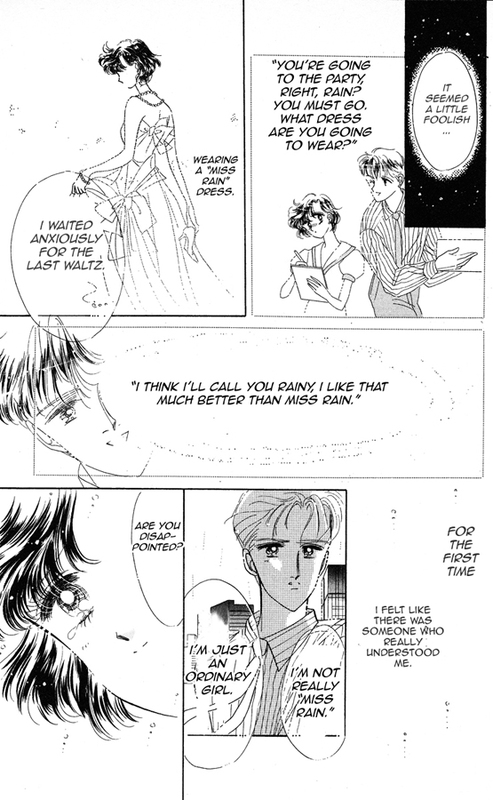 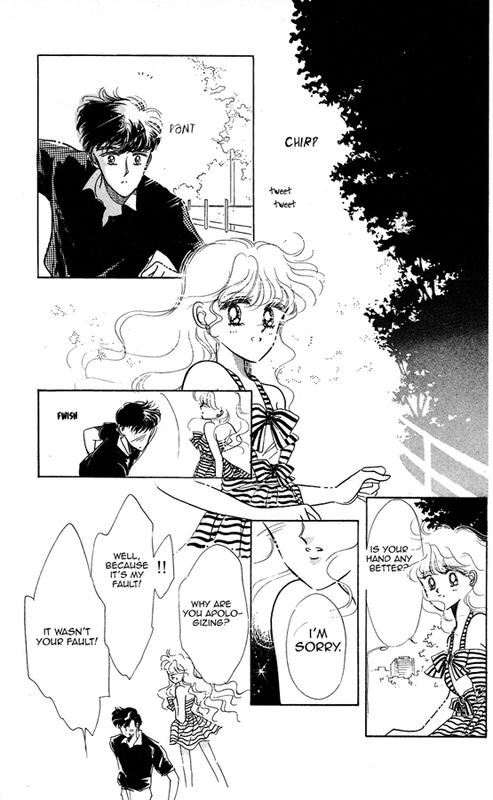 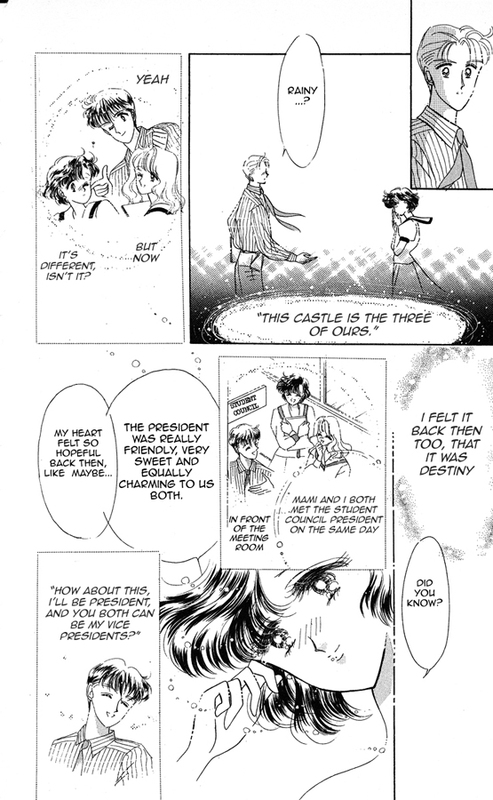 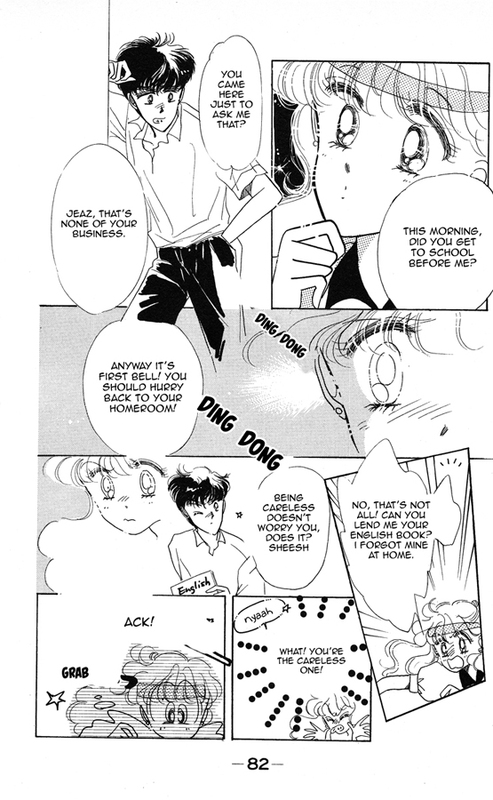 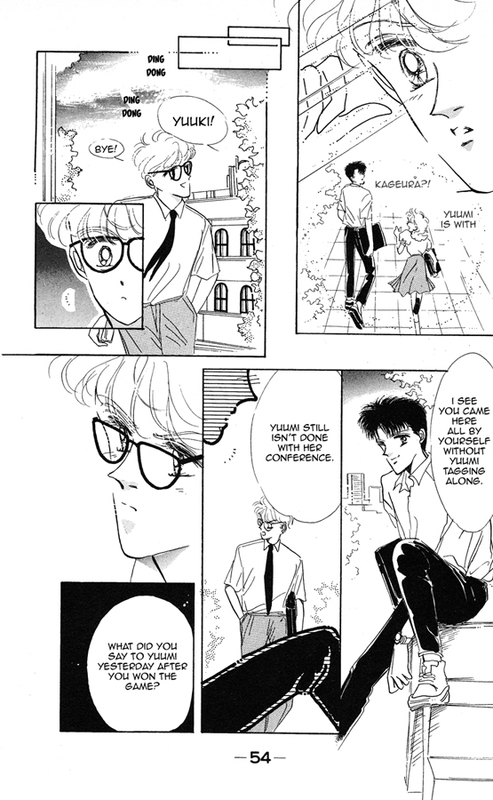 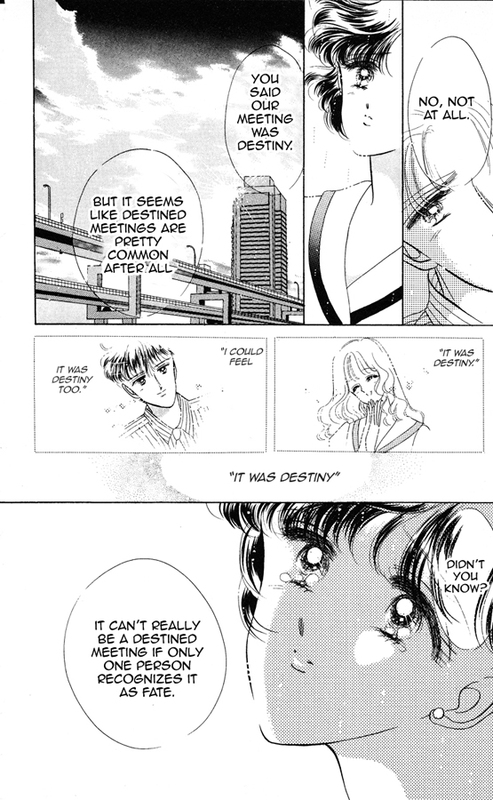 This is an interesting love triangle story with a twist ending that is atypical of Naoko Takeuchi’s works. 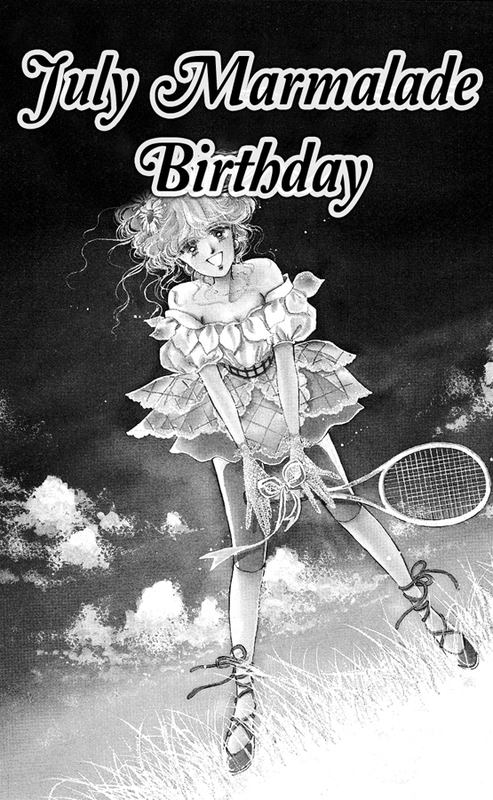 July Marmalade Birthday focuses on Miina, a girl who has just turned 16 years old. 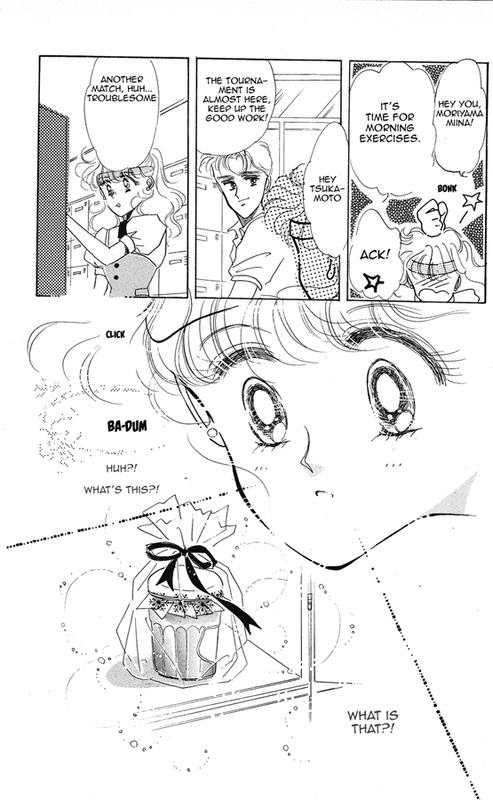 She mysteriously finds a jar of Lemon Marmalade in her locker, which appears to be a birthday gift from someone…but she doesn’t know who has given it to her! 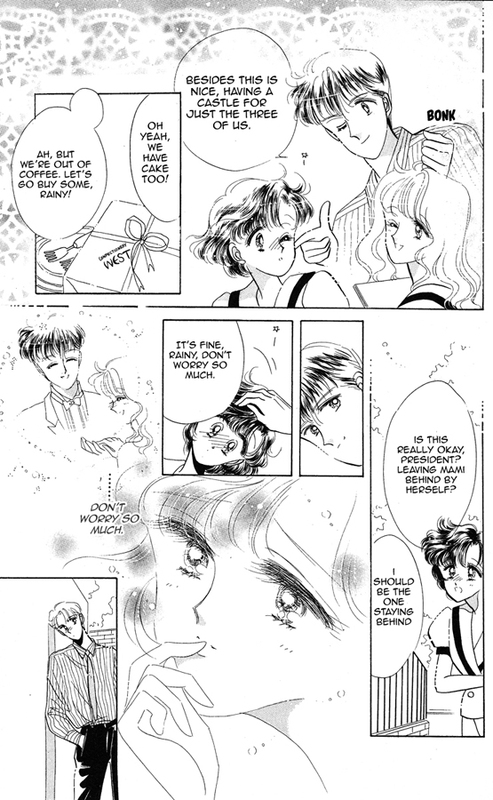 Miina’s best friend Yayoi speculates that it’s from a secret admirer, and it seems that the mysterious boy Tsukamoto is a likely suspect. 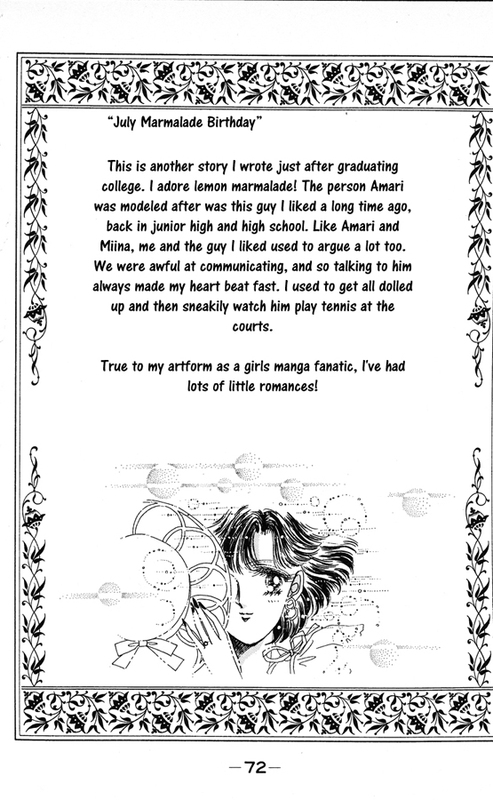 But Miina doesn’t want any admirer but a guy named Amari… who seems content to flirt with other girls and concentrate on his tennis game. 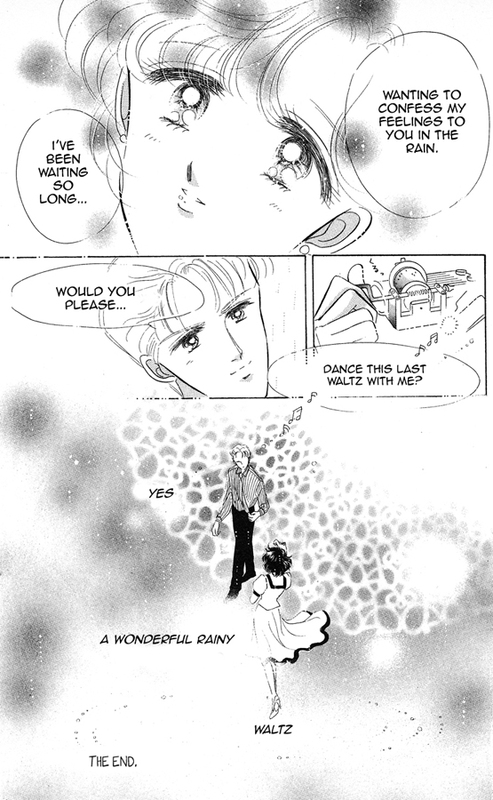 Maigo no Swing the “Lost Child’s Swing,” is the most solemn story of the Miss Rain collection by Naoko Takeuchi. 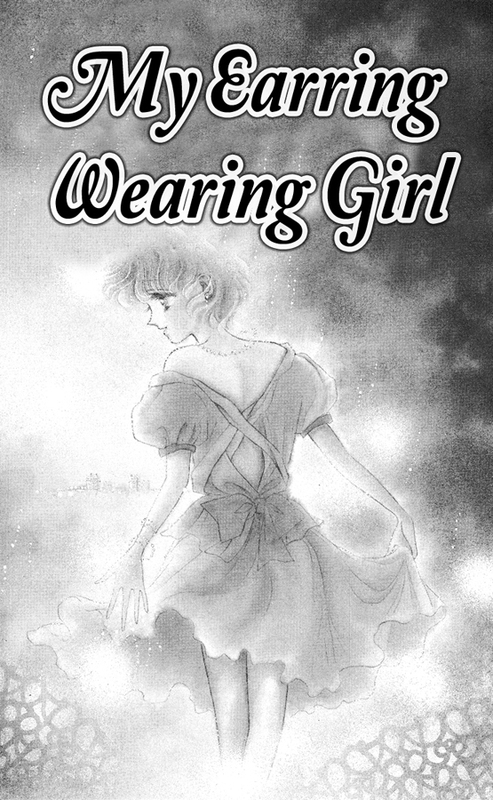 The main character is the girl Tokai Mima. 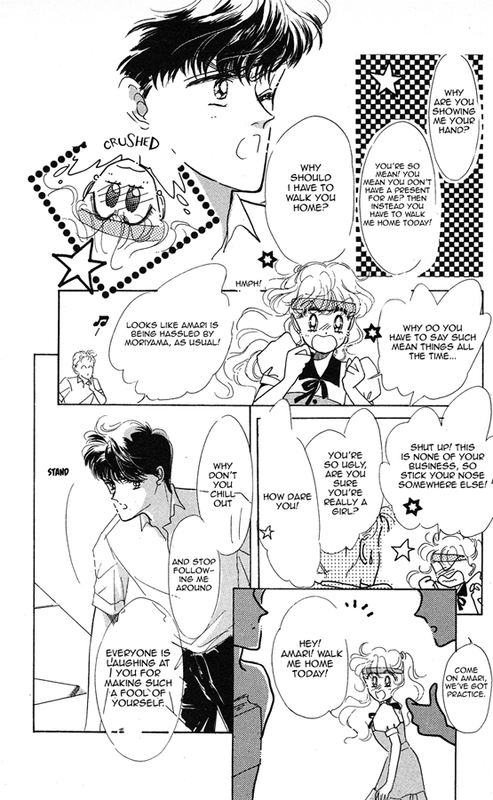 Mima is unmotivated in school, and gets such bad grades that she needs tutoring after school from her teacher, Mr. Maejima. 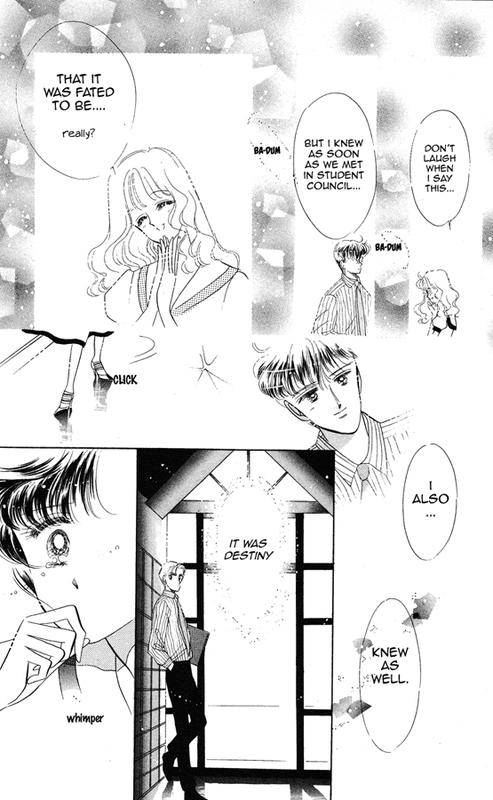 Mima enjoys his attention, but soon Maejima meets Mima’s older sister, Tokai Sawako. 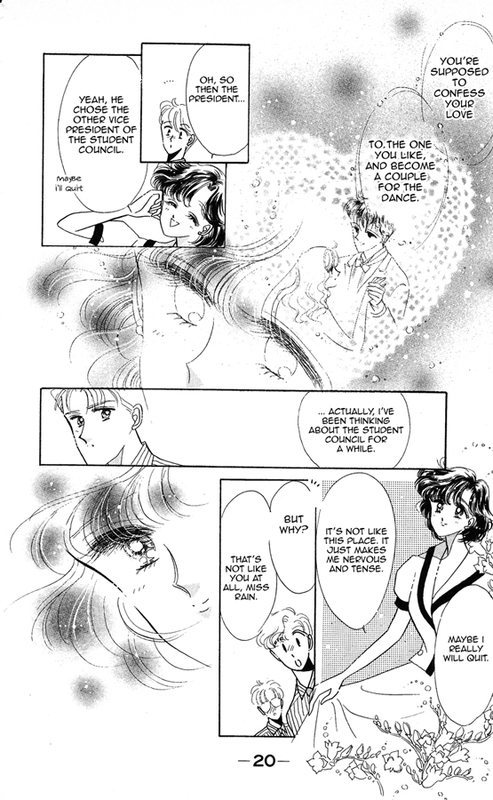 Mima sees Sawako as everything that she is not: bright, pretty, mature, and more attractive to men, and Mima gets jealous when Maejima pays attention to Sawako. 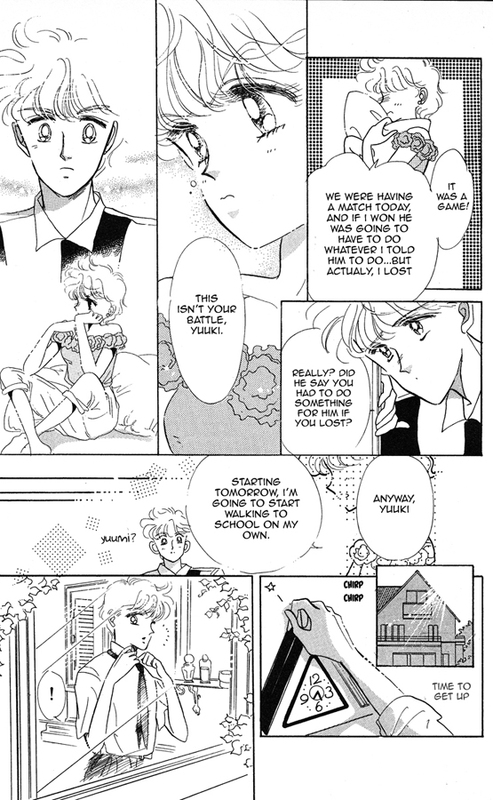 Take a read to find out how this story ends! 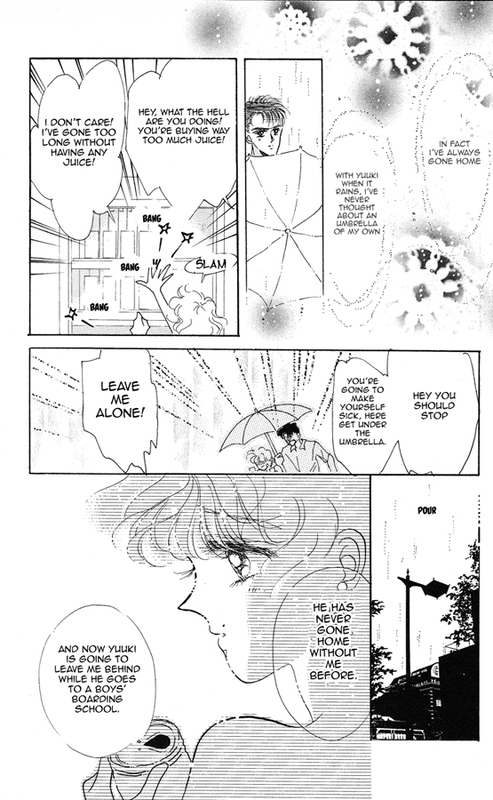 Itsumo Issho ne, “Always Together,” is the story of Yumiko and her dog Aniline. 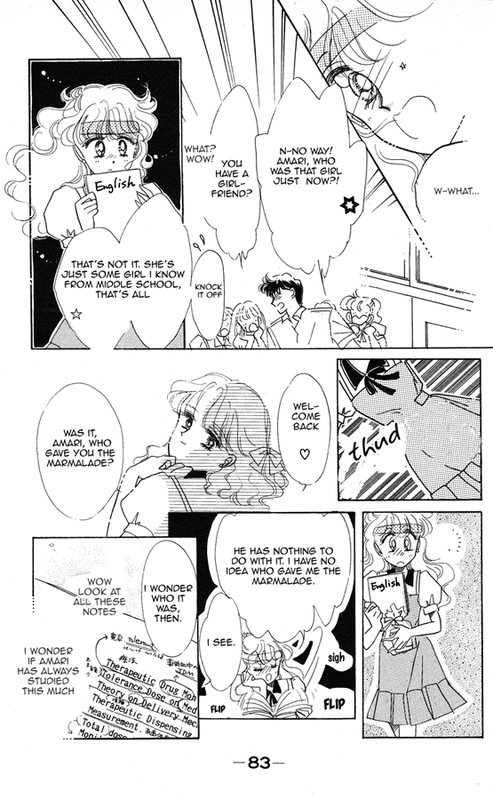 Yumiko is sure that the new boy at school, Hamao, is the same person as her long lost childhood friend. 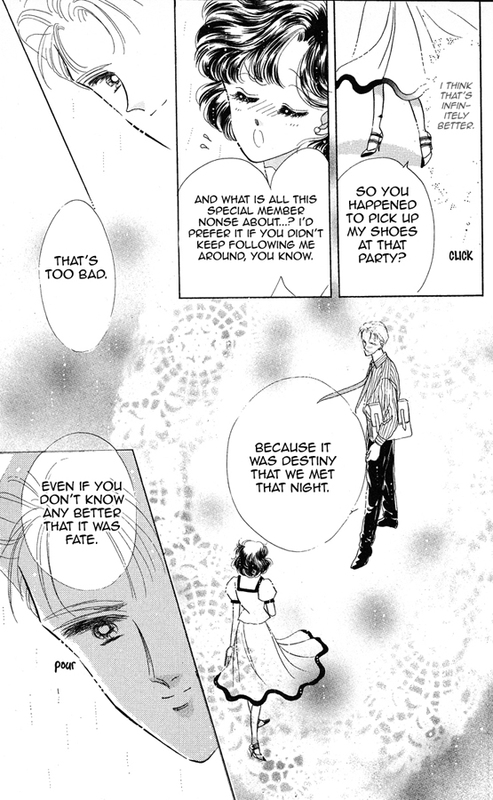 But for some reason Hamao doesn’t want to remember Yumiko or her dog Aniline, and he brushes them both off. 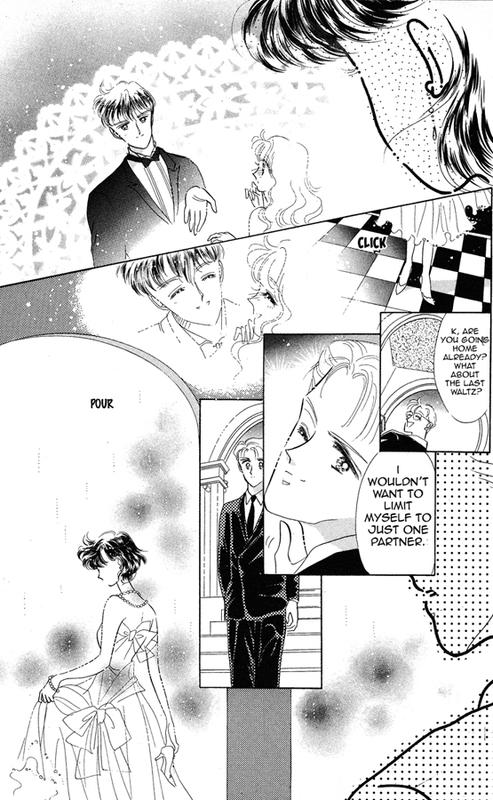 This is a bitter sweet story of romance, tragedy, and beauty.